We pioneered subprime desking and still offer the industry’s best solution! ProMax was the first company to introduce the capability to extrapolate data from both the credit application and credit bureau. We then cross reference that with every applicable bank guideline, or based on a call-back already received, to find you the most profitable combination of customer, car, and lender. We also enable you to structure perfect deals before submitting to ensure you maximize your chance to avoid the automatic turn down. 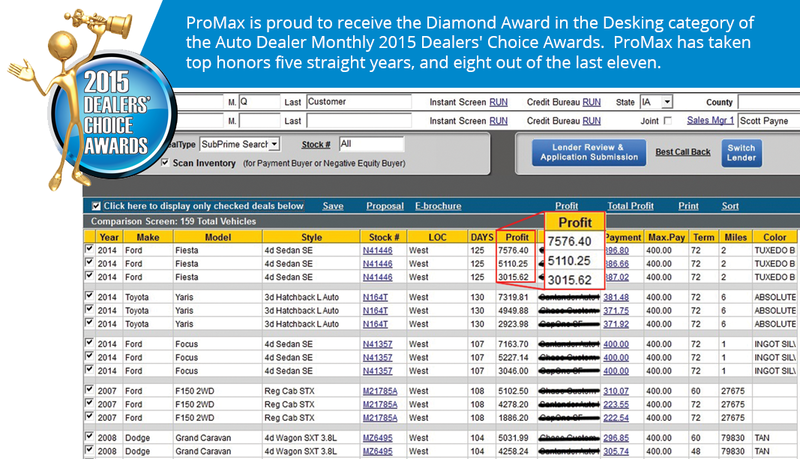 A unique feature of ProMax Unlimited is the ability to take a call back and scan an entire dealer group’s inventory to look for specific types of vehicle that guarantee the greatest profit potential, or to move aged vehicles. We also enable you to print professional proposals complete with pictures of the vehicles you are presenting to the customer, or send E-Brochures including the same information.